As part of the refit of Bonegi I'm looking to replace current anchor and chain. I have a rusty Danforth anchor mounted on the foredeck and 55m of rusty 8mm chain fed through a chain pipe and stowed in the space between the forepeak berths. I've acquired a Simpson Lawrence manual windlass, 30m of 8mm calibrated chain and a 19.5lb CQR anchor. I'm thinking of using the CQR as a kedge anchor and the chain and windlass with a new bower anchor, any thoughts on type and weight of bower anchor? Also any thoughts on positioning the windlass on the foredeck, does anyone stow anchor chain in the space forward of the forepeak berths, it is an empty space but may be too awkward to access. In order to minimise weight at the bow, I prefer to have my anchor rode (65m of 8mm chain) stowed as far aft as I can practically have it, i.e. in a chain locker between the bunks. 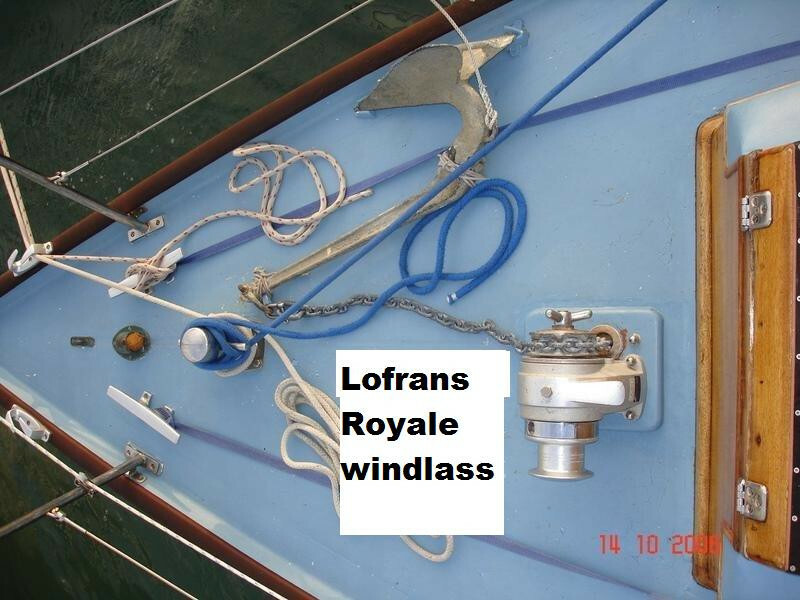 My Lofrans Royale manual windlass is located on deck above the chain locker so the chain drops straight into it. It also has the advantage that it is close to the forward end of the coachroof so I can sit on the forehatch and crank away in comfort. Thanks for the swift response, I had thought that weight at the bow may be a deciding factor. The photos are very useful, I'm likely to put my windlass in the same position and feed into the existing chain locker. I note your CQR anchor what size is it? The other thing I need to resolve is where to store a kedge anchor and chain/rope. The one in the picture was 20lb, after reading Eric Hiscock's recommendations "Cruising Under Sail" I replaced it with a 35lb but handling that on a narrow foredeck is hard work so, as a concession to old age and frailty, I am trying a 25lb CQR. By the way, if you like to have your anchor at the bow, the genuine CQR fits very snugly in the bow roller. I'd concur with JT, especially over keeping weight out of the ends. 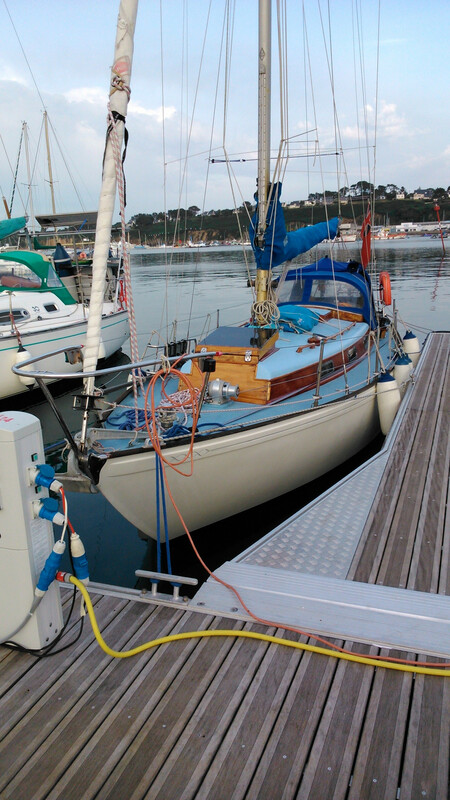 We have a 35lb (15kg) CQR with 60m of 8mm chain with the chain locker exactly as John's between the fo'c'sle berths. No windlass yet, the crew can still cope! We also carry a 30lb 'Fisherman' anchor stowed against the ship's side at the aft end of the stbd fo'c'sle bunk locker. Plus the original 25lb Danforth which lives in the bottom of the stbd cockpit locker (when it's not lashed to the pushpit for daily use in the Baltic). Finally we have a 25lb anchor weight (Chum) and a BIG bow shackle which enables us to lower it down the chain. The latter has been used a couple of times and, like insurance, you're very glad you have it when the chips are down. One last little tip: The inner (bitter) end of the chain should always be secured. But make sure you use a length of line long enough to come up the chain pipe and onto the deck. We were once at anchor in the N of Spain when a vicious thunder squall struck and the big steel yacht upwind dragged her anchor. We rapidly veered all we had and she just missed us. Had it have been any closer we could have cut the line and escaped. Lots of information, it looks like you are set up for all eventualities John. I am considering having a 35lb CQR as my main anchor but I had a 25lb CQR on my last boat a folkboat but it did dragged once when anchored in weed between Tresco and St Martins. Any thoughts on the more modern Rocna and Vulcan anchors? I'm looking forward to using a windlass, either things are getting heavier or I'm getting weaker with age. VIVEZA has a 25lb CQR. This has worked very well; in one gale it dug in the Pyefleet mud so deeply that I had to wait for the tide to rise and break it out. There is also a 25 lb Fisherman. This was used, by my Father, in rocky and weedy bottoms - or as one of a two anchor mooring. It's not aboard at the moment as it is heavy but will be if I go a bit further than Falmouth. It will fit in the locker under the cockpit where the aluminium Danforth type kedge lurks. This kedge has worked well. The galvanized chain [8mm or so say] 'stows' in a locker between the two vee berths. It's 40 metres. The hawse pipe on deck is just forward of the cabin top. The last 5 or so metres have never self stowed and it has always been necessary for someone to go below and help. The plastic sink drain water pipe that takes the chain down from the deck to the locker can be removed. At one time there was an infill to the vee between the two berths to create a much wider double bunk. I think this was something to do with the production of future skippers. Obviously this only works if all the chain is on deck or you are in a marina. It does make a much nicer sleeping area and something I'd consider; particularly for children. The chain locker has a drain pipe that leads under the cabin sole to the bilge under the engine. This is to stop water lurking under the sole. This works well. I recommend it. It was only recently that I connected this drain to the fact that, on passage, the bilge fills under certain conditions. This is when water breaks on deck and disappears down the hawse. I shall [hopefully] remember to stop it off in future. The last 5 metres or so [nearest the anchor] of the [to be removed] chain is now very rusty. On the advice of a Member I now have 40 metres of stainless steel chain. This will self stow - it's far more 'fluid' than galvanized. It was £12.43 a metre [September 2018] plus VAT from Boat Gear Direct. I also have a 50 metre warp plus heavy [10 metres of 10mm?] chain combination stowed forward. This I'd need in deeper water anchorages...and I could even connect this to the end of the stainless chain or use for a 2nd anchor...if it was aboard. Regarding the choice of anchors I have to say that we would never go to sea with the anchor on the stem. The CQR stows quite nicely on deck. I'm not sure about how the Rocna would stow with its 'roll bar' and I'm not familiar with the Vulcan. The 'real' CQR is forged and is strong. There are much cheaper 'lookalikes' available which are cast. I have seen one which broke when dropped from a height onto a hard surface. As ever it's the buyers choice, but I know which one I trust my yacht to! I'm finding choice of anchor the most difficult decision, there doesn't seem to be an anchor that is good for all types of sea bottom. While I found the CQR on the folkboat good for most situations, it did drag in weed and shoaling gravel off Arran Island. What I have read of the Rocna and Vulcan anchors being self righting they dig in fast and hold well, although not so good on a rocky bottom. Stowing on the foredeck is more of a problem, I think the expectation is that they are stowed on the stem and I agree not the best place when offshore. Interesting to get the different ideas, I shall make a decision during the winter. Does anyone know if a Rocna or Vulcan fits on a Twister stem? Paul is quite right in terms of getting the fore and aft trim right BUT having weight in the 'ends' is bad because it accentuates pitching (something to do with the 'radius of gyration' I think if you want to be technical) and as we all know Twisters don't like a short head sea.